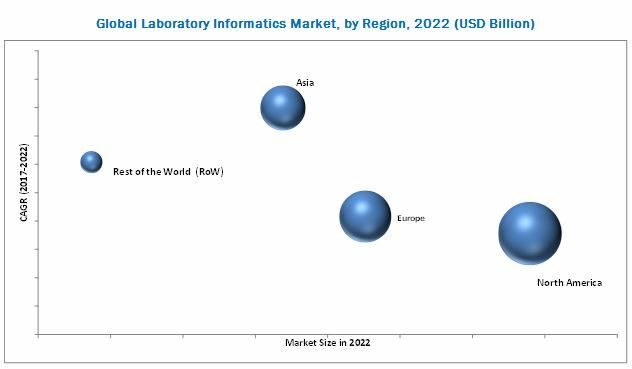 [239 Pages Report] The global laboratory informatics market is projected to reach USD 3.16 Billion by 2022 from USD 2.20 Billion in 2016, at a CAGR of 6.4% during the forecast period. The base year considered for this study is 2016 and the forecast period 2017-2022. The study estimates the global laboratory informatics market for 2017 and projects its demand till 2022. This research study involved the extensive use of secondary sources; directories; databases such as Hoovers, Bloomberg Business, Factiva, and OneSource; white papers; annual reports; company house documents; and SEC filings of companies. Secondary research was mainly used to identify and collect information useful for the extensive, technical, market-oriented, and commercial study of the global market. It was also used to obtain key information about the market classification and segmentation according to the industry trends, regional markets, and developments related to market and technology perspectives. In the primary research process, various sources from both demand side and supply side were interviewed to obtain qualitative and quantitative information of the report. Primary Sources from the supply side include various industry CEOs, vice presidents, marketing directors, technology and innovation directors, and related key executives and key companies and organizations operating in the lab informatics market. The primary sources from the demand side include experts, research professionals, chief information officers (CIOs), laboratory technicians, and laboratory managers from pharmaceutical laboratories, chemical industries, environmental laboratories, metal and mining industries, biobanks/biorepositories, and contract research organizations. 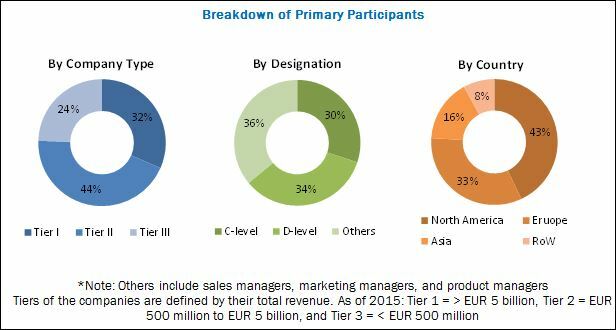 For market estimation process both top-down and bottom-up approaches were used to estimate and validate the market size of the global laboratory informatics market as well as to estimate the market size of various other dependent submarkets. All possible parameters that affect the market covered in this research study have been accounted for, viewed in extensive detail, verified through primary research, and analyzed to get the final quantitative and qualitative data. This data is consolidated and added with detailed inputs and analysis from MarketsandMarkets and presented in this report. The market is diversified and highly competitive, with a large number of players competing for market space, including mid-tier companies and startup firms. Thermo Fisher Scientific, Inc. (US), LabWare (US), LabVantage Solutions, Inc. (US), Abbott Informatics (US), Waters (US), Agilent Technologies (US), IDBS (UK), PerkinElmer Inc. (US), Autoscribe Informatics (UK), Arxspan LLC (US), Dassault Systèmes (France), RURO Inc. (US), Kinematik (Ireland), LabLynx, Inc. (US), and LABWORKS (US) are prominent players in the global laboratory informatics market. This report categorizes the global laboratory informatics market into following market segments and subsegments. Note: *Other industries include forensic laboratories, metals and mining and biofuels. Further breakdown of the Rest of the World lab informatics market into Pacific Countries, LATAM, and Middle East and Africa. The global laboratory informatics market is projected to reach USD 3.16 Billion by 2022 from USD 2.32 Billion in 2017, at a CAGR of 6.4% during the forecast period. A number of factors, such as the increasing need for lab automation, development of integrated lab informatics solutions, regulatory requirements, growing demand in biobanks/biorepositories, academic research institutes, and CROs, and rising awareness are expected to drive the growth of the market. On the other hand, the dearth of trained professionals and lack of integration standards are expected to restrain the growth of this market in the coming years. This report segments the global laboratory informatics market into by type of solutions, component, deployment model, industry and regions. On the basis of the type of solutions offered, the global market is segmented into laboratory LIMS, ELN, CDS, EDC & CDM LES, ECM and SDMS. The LIMS segment is expected to account for the largest market share in 2017. This segment is also projected to register the highest CAGR during the forecast period. The large share of this segment can be attributed to the wide range of benefits associated with the use of these systems, including increased workflow efficiencies, easy integration with other lab systems, reduced transcription errors, and better regulatory compliance. The global laboratory informatics market, by component is segmented into services and software. In 2017, services are expected to account for the largest market share and are expected to witness high growth during the forecast period. . Growth in this segment can be attributed to the technological advancements in solution offerings by various vendors, increasing adoption of cloud-based solutions, growing need for consulting services, and the recurring nature of services. Based on the deployment model, the global laboratory informatics market is segmented into on-premise, cloud-based, and remotely-hosted deployment models. The on-premise model segment is expected to account for the largest market share, while cloud-based deployment models are expected to register highest CAGR during the forecast period. Advantages of the cloud-based model such as on-demand self-serving analytics, no upfront capital investment for hardware, extreme capacity flexibility, and a pay-as-you-go pricing model are driving the growth of this market segment. On the basis of industry, the laboratory informatics market is segmented into life sciences, chemical, food & beverage and agriculture, petrochemical refineries and oil & gas, environmental testing laboratories, and other industries (forensic laboratories, metals and mining, and biofuels). In 2017, lifesciences industry segment is expected to account for the largest share of the market. Factors such as the growing applications of molecular diagnostics, rising outsourcing by pharmaceutical industries, growing need for integrated systems, stringent regulatory guidelines to be followed by pharmaceutical laboratories, increasing number of biobanks/biorepositories due to the increasing number of biobanking applications, rising need to integrate laboratory systems, and growing awareness and availability of technologically advanced laboratory informatics solutions are driving the growth of the global market for the life sciences industry. On basis of type, the life science industry is segmented into pharmaceutical and biotechnology companies, biobanks and biorepositories, molecular diagnostics & clinical research laboratories, contract services organizations (CROs and CMOs), and academic research institutes. Among these biobanks/biorepositories are expected to witness the highest growth during the forecast period. The demand for high-quality specimens has driven the need for automated storage, preparation, and information management to obtain accurate, reliable, and standardized data. Other factors such as government funding for scientific research activities, growing collaboration between market players to offer laboratory informatics solutions to biobanks contribute to the growth of this market segment. The market is dominated by North America, followed by Europe. North America dominated the market in 2017, while Asian market is projected to register highest CAGR during the forecast period. The dominance of the North American market is attributed to strong economies in the US and Canada, which have allowed for significant investments in new technologies, growing demand for the integration of laboratory systems, rising government funding for research, need for early drug discovery, easy availability of laboratory informatics products and services, and stringent regulatory requirements across industries. While the laboratory informatics market presents significant growth opportunities, market growth may be hindered due to a dearth of trained professionals. The global market is diversified and highly competitive, with a large number of players competing for market space, including mid-tier companies and start-up firms. Prominent players in the market include Thermo Fisher Scientific, Inc. (US), LabWare (US), LabVantage Solutions, Inc. (US), Abbott Informatics (US), Waters Corporation (US), Agilent Technologies (US), IDBS (UK), PerkinElmer Inc. (US), Autoscribe Informatics (UK), Arxspan LLC (US), Dassault Systèmes (France), RURO Inc. (US), Kinematik (Ireland), LabLynx, Inc. (US), and LABWORKS (US). *Top 25 Companies Analyzed for This Studies are - Thermo Fisher Scientific,Inc., Labvantage Solutions, Inc., Labware, Abbott Informatics, Waters Corporation, Agilent Technologies, Perkinelmer, Inc., Dassault Systèmes, Autoscribe Informatics, Accelerated Technology Laboratories, Inc., Ruro, Inc., IDBS, Kinematik, Arxspan LLC, Novatek International, Nippon Control System Corporation., Labtrack, LLC, Chemware (A Dohmen Company), Computing Solutions, Inc., Lablogic Systems Ltd., Justicetrax, Sapio Sciences. Labworks, Promium LLC, Lablynx, LIMS.